SKB Sails merges traditional sailmaking skills and eye for detail along with the modern technologies and cutting edge cloth now available. Using the latest design software from Sail Science and our own in-house Aeronaut cutting arm along with performance sail cloth, threads, tapes and hardware mean that we can guarantee the quality of our sails. All sails from SKB are designed and built in the SKB sail loft in Penryn. 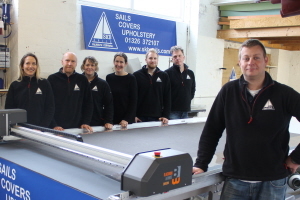 The in-house cutting facilities mean that all aspects of the build process can be carried out by our own sailmaking team to ensure that customers get the highest quality performance sails along with bespoke craftsmanship and finish. The life of all sails, covers and upholstery can be extended dramatically with a little care and attention. Furling sails will often need at least one or two U.V. strip replacements in their lifetime, and covers will often require re-stitching and patching if they have been subject to a lot of U.V. exposure and or chafe damage. We all know accidents happen, and whether you are racing or coastal cruising you may find yourself with a torn or damaged sail that you need back in a hurry. Here at SKB Sails we have built up a reputation for designing and building high performance new sails for traditional craft, blue water cruisers and racing yachts alike. With knowledge and experience in all areas of sailmaking we can guarantee our sails will look great and perform throughout their life.